With the latest Fanatically Zen release it is now possible to sync multiple Zendesk instances with a single SugarCRM or SuiteCRM instance. Have an instance for different product lines? Do different departments run their own Zendesk apps? Sync them all to Sugar. Do you want a contact in Sugar to exist in all Zendesk instances? Do you want to have that contact only live in a specific Zendesk instance? Hey, no problem-o. That can be done as well. Does a customer belong in more than one Zendesk instance? All tickets from all of those instances will be displayed in a single dashlet in Sugar. Each ticket will show a label that specifies the exact Zendesk instance it is from. If your customers exist in only one Zendesk instance, you can select a field that determines which Zendesk instance we should lookup tickets in. 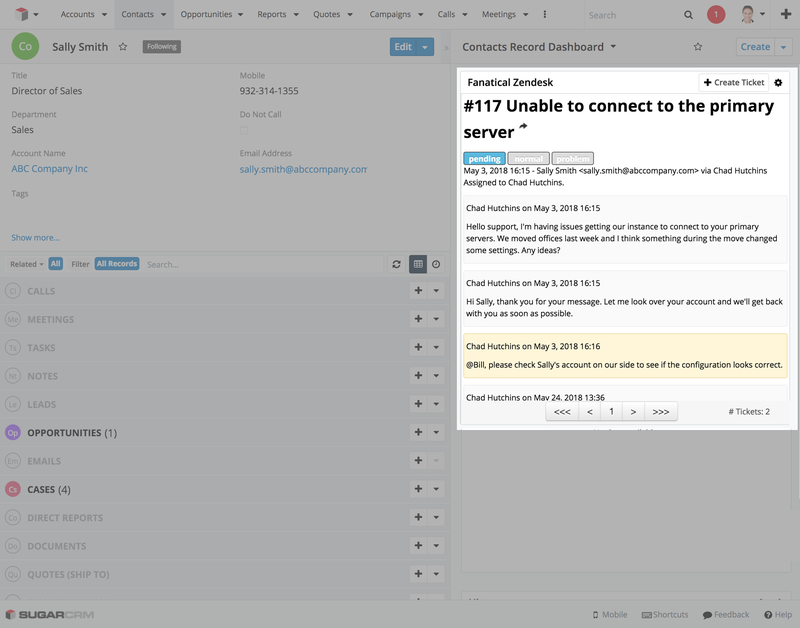 With multiple installations of Zendesk you can define custom views in each for which data from Sugar should display. This is especially handy when employees in the first Zendesk instance only need access to certain CRM fields while employees in the second Zendesk instance need access to other CRM fields. When it comes to syncing Zendesk data to Sugar, it is possible to configure exactly which modules the Zendesk data gets synced to. You can can sync Zendesk Tickets to CRM cases, Zendesk Contacts to CRM Leads, you can sync to custom modules and custom fields. It is very flexible. When you have the Zendesk to Sugar syncing enabled with multiple Zendesk instances syncing, you choose exactly which data syncs to Sugar for each Zendesk instance. Hop on over to the Fanatically Zen listing and start a new trial for each Zendesk instance that you want to sync with Sugar. Simply schedule a call or create a new ticket and Fanatical Labs will get you all set up at no additional cost. The Sugar/SuiteCRM & Alfresco Integrator by eVolpe is a perfect solution for all the companies, which are currently deploying or already using both of the systems. Are you facing difficulties trying to coordinate your documentation in the context of sales opportunities? This is the best solution! Ensure your CRM implementation gets off to a flying start with an expert consultation covering everything you need to know, from both a technical and business viewpoint.